Find AHRI Certified® Air-Cooled Water-Chilling Packages Using the Vapor Compression Cycle. Additional standard–related documents available on the Standards web page. Specification Sheet Verification Complete this form for each ACCL specification sheet verification request and submit by also completing this online form. A copy of the output report from the manufacturer’s Selection Rating Software must be submitted in conjunction with this form. All fields must be completed prior to submission. Note that AHRI only verifies the Certified Data shown on each output report. Air-Cooled Water-Chilling Package. A factory-made and prefabricated assembly (not necessarily shipped as one package) of one (1) or more compressors, condensers and evaporators, with interconnections and accessories including controls, designed for the purpose of cooling water. It is a machine specifically designed to make use of a vapor compression refrigeration cycle to transfer heat from a cold water fluid circulating system to the air. Custom Unit. A unit that is not specifically listed in a publicly available sales brochure, magazine advertisement, website posting or Catalog / Selection Rating Application that is a single instance product which contains components or additions that change the performance such that ratings can no longer be obtained by utilizing the Participant’s Catalog / Selection Rating Application. Custom Units shall not be certified and shall not be listed in the AHRI Directory of Certified Product Performance. Field Trial Unit. A unit that is produced and provided to a customer, for the purpose of gathering data on potential new products. These units are intended to transition into regular production should the field trial be successful. Field Trial Units are subject to the requirements of Custom Units. Field Trial Units shall not be certified and shall not be listed in the AHRI Directory of Certified Product Performance. New Product Introduction. A new product is one that falls under the Program scope that is available to be marketed, but is not available for standard production and is not listed in the AHRI Directory of Certified Product Performance. Within nine (9) months after AHRI has received notification of New Product Introduction Unit, the Participant shall add the New Product Introduction Units to the Directory in accordance with Section 9.2 or else be in violation of AHRI’s Certify-All Policy. Modular Chiller Array. A combination of individual certified chillers that may or may not include, from the factory, all required piping, wiring and controls to make the modular chiller array complete. The Modular Chiller Array is not certified, similar to when other certified chillers are piped and controlled together in the field. 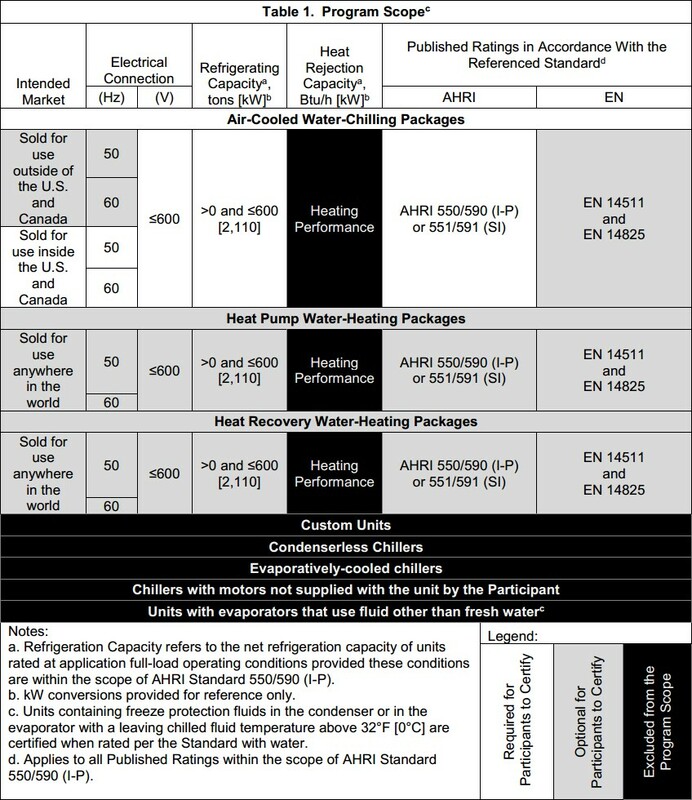 This Program tests and certifies Air-Cooled Water-Chilling Packages Ratings as defined in this Section. Tested Cooling Ratings. AHRI tests published ratings to AHRI Standards 550/590 (I-P) and 551/591 (SI) and EN Standards 14511 and 14825. Units that are not able to operate at Standard Rating Conditions shall be tested at the unit design conditions. Additionally, AHRI shall select a random point within each unit’s published AHRI Certified operating map. This random operating point (5th point) shall be selected to allow AHRI to certify the published operating map conditions at which the unit can operate. Certified Cooling Ratings. AHRI certifies published ratings to AHRI Standards 550/590 (I-P) and 551/591 (SI) and EN Standards 14511 and 14825. Integrated Part-load Value (IPLV.IP and IPLV.SI). IPLV.IP and IPLV.SI are not certified for units which are not able to operate at Standard Rating Conditions. NPLV.IP and NPLV.SI are not certified metrics and not subject to the requirements of this Program.